We get a lot of questions from people who call us about the realities of staying warm in a yurt in cold climates. Reality is… YES… you can stay warm and cozy! In order to accomplish this, insulation is important. The reflective insulation used by Yurt companies is surprisingly effective. Sure surprised me when we were living in Yurts in the mountains of Montana! Small Yurts are easier to heat than larger Yurts. When you purchase your wood stove or other heating system, think big. Purchase a system that is a little overkill for a building the square footage of your Yurt. If you have a larger Yurt (24 to 30 ft), a great way to hold the heat in is to build an upstairs in your Yurt. When you build the floor for the upstairs, you should insulate it very well. That’s what really helps to keep the heat down in your living space. With the tall walls in all of our Yurts, there is plenty of room to add an upstairs. Of course this adds much more living space, as well as creates a way to keep the heat down in your living space (since heat flows upwards). We always have a lot of windows in our Yurts, and we found that it was most effective to really focus on insulating the roof (or the floor of your upstairs). Any home with a high ceiling will be more difficult to heat. This is not just an issue with Yurts. When you build an upstairs, the room that you create upstairs is a very special space, as you have the beauty of the roof rafters, center ring, and dome as your ceiling. Along the perimeter where the roof is low you can put shelves, dressers, etc., and use the center as the space where you can stand up and move around. Our 30 ft yurt is 15 ½ ft tall at the center ring! That leaves a lot of space for an upstairs. We recommend this way of keeping your heat in your downstairs living space if you are in a very cold climate and are feeling that you are losing too much heat. It is so effective. 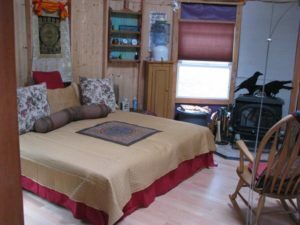 Call us if you would like more information about how to go about adding an upstairs or a loft to your Yurt! If you are building an upstairs or a loft, one way to create a staircase without taking up a lot of space is to put in a spiral staircase. They are very beautiful. Use a fan that is mounted high in your ceiling to blow the warm air back down into your living space. You can turn a fan on low so it is quiet. This is very effective in areas where the climate is moderately cold. Think of your Yurt as any other building. What would you do to your home to make sure your heating system was working efficiently? Are there drafts around your windows and doors? If so, use weather-stripping to create a better seal and eliminate drafts. Find a good book, sit by the fire, and enjoy winter!